One of the biggest concerns of electronic manufacturing is the reliability of the components being used. Counterfeit electronic components have long been a thorn in the side of manufacturers, and the counterfeit industry continues to thrive by adapting new methods to mask part authenticity. Old parts are refurbished and resold as new parts. Old parts are relabeled and sold as entirely different parts. Obviously, this can be a big problem for a manufacturer. Many times, these components do an excellent job mirroring the ones you ordered and don’t always fail initial testing. But down the line, they can cause failures with potentially severe consequences. Think of a fire alarm or communication equipment in a mine -- if these devices fail, lives can be put in serious danger. Despite this, the properly trained eye can spot a counterfeit part fairly easily. Therefore, it’s important to educate your team on what to look for during part inspection, and to remember to check all components regardless of supplier. Perhaps the easiest way to identify phony parts, many times counterfeit manufacturers in China lack the ability to properly replicate the marking on the part package. Things like incorrect font, misspelled words, incorrect part number, logo or country of origin can be an easy sign that the part isn’t genuine. Look at the example below. 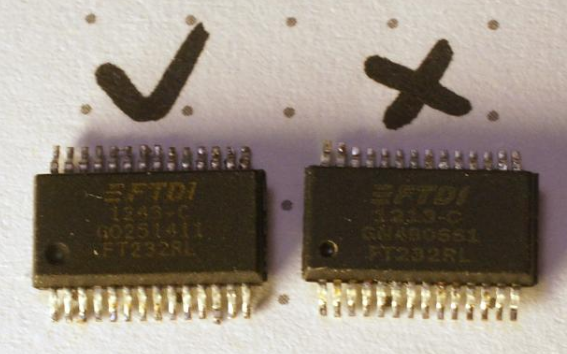 There are several warning signs here that the chip on the right is fraudulent -- can you spot them? It’s the different font, part number, and indent size that gives this fraudulent chip away. Sometimes these can be subtle and should still be tested further, but usually the eye test serves as a good barometer for whether a part is legitimate. If the part is RoHS-approved, X-ray inspection can be used to confirm its lead-free status, something that counterfeiters often overlook. A scanning acoustic microscope (SAM) can be used to locate laser etching underneath blacktopping. If etching is discovered, it’s an obvious sign that resurfacing was used to cover up the original markings. Unlike the acetone treatment, the use of SAM to discover blacktopping is nondestructive, allowing you to use the component if it passes inspection. Counterfeiters have become quite good at replicating the plastic and fine glass mixture that makes up most of today’s plastic electronic components. The process behind this ‘resurfacing’ is called blacktopping. It requires sanding off the original markings and applying a coat of polymer to cover them up like nothing happened. But sometimes, this effect can leave visible clues of its illegitimacy. For example, sometimes indents on a chip that’s been blacktopped will be partially filled in by the polymer, or the smoothness of the indent’s original surface will still be visible. In some cases, a more invasive means may be necessary to determine component legitimacy. These processes are called “destructive” as they render the components unusable afterward. The first destructive method is called decapsulation. This involves placing abrasive acids on the surface of the component until the internal dye reveals itself, which can then be inspected with a microscope. If the component is made from ceramic packaging, the lid can be manually removed in a similar process called de-lidding. In the case of blacktopping, one destructive test calls for acetone to be applied to the top of the chip package, usually with a cotton swab. If residue from the chip comes off, the chip is a no-go. You can also perform a scrape test, which can determine if a clear coat was used to hide the use of blacktop. As mentioned above, some counterfeit parts are resurrected from scrap electronics and sold off as new. In this scenario, some physical wear and tear can visible, such as bent leads or scratch marks. These should tip you off to possible authenticity issues with your parts. While these methods are all effective at identifying potentially counterfeit parts, you should limit your purchases to authorized distributors and take the initiative to subject your components to multiple tests. Authorized distributors are the safest way of avoiding counterfeits but aren’t always the answer. If you need obsolete or hard-to-get parts, you may have to take a gamble on an outside distributor. Keep in mind, as identification techniques improve, counterfeit operations will adapt their strategies. It’s important to remain vigilant and up to date on the latest information regarding counterfeit parts and inspection. Completely avoiding the counterfeit problem is impossible, but it is possible to stay one step ahead of it. Once you’ve got legitimate parts, make sure you are having them properly attached to the boards. Getting the right AOI equipment is vital to the success of your production. Click here for more on how to better deal with obsolete components. Or, click the button below for free sizing charts for components!